In the face of mounting and alarming scientific evidence of climate change, environmentalists have targeted the construction of the Keystone XL (KXL) oil pipeline as ground zero in the battle to stop global warming. Environmentalists have nightmares about Republicans in control. They rightfully worry that Republicans, many of whom openly state they think global warming is a hoax, will roll back new regulations on greenhouse gas emissions and accelerate the efforts of the big oil corporations to extract more profits at the expense of people and the environment. Indeed, after Republicans won big in the midterm elections, taking control of the Senate and expanding their seats in the House, they immediately announced plans to use their majorities to pass legislation forcing the president to approve KXL. But it wasn’t Republicans pushing for a vote on KXL in the Senate; it was Democratic Senator Mary Landrieu of Louisiana, aided by Democratic Senate Majority Leader Harry Reid. Between the House and the Senate, 44 Democrats voted with the Republicans to approve KXL. Clearly, the Republican leadership doesn’t take the threat of climate change seriously. However, the Democrats, while paying lip service to climate change, have stymied global climate talks and refuse to boldly put forward what is necessary to halt global warming. The construction of Keystone XL will be prevented not by politicians, but by united mass protests organized by ordinary working people. 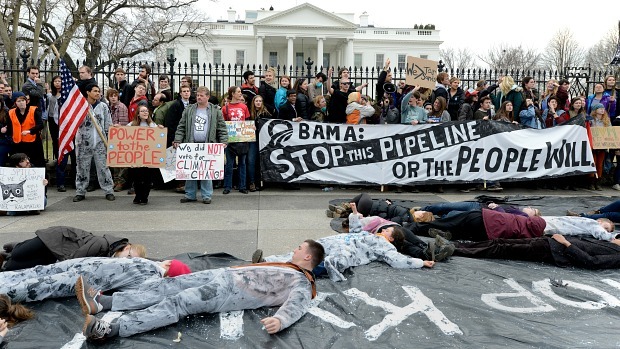 When Republicans take over in January, they will force another vote on Keystone XL. There is no guarantee that Obama will exercise his veto power to stop its passage. The September 21 People’s Climate March featuring 75 labor unions and hundreds of social justice organizations shows the way forward. Half a million people marching in New York, 2,000 in Seattle, and actions in over 160 countries show the widespread support for serious action to stop climate change. If Obama caves to pressure from big business and Republicans, we must respond with mass rallies and marches and, where effective, non-violent civil disobedience to demand the pipeline and any other fossil fuel project be scrapped. Earth Day this year should be marked with millions in the streets demanding investment in clean energy jobs, not new wars. No new fossil fuel projects – stop the Keystone XL pipeline! A massive jobs program to build clean energy infrastructure and mass transit, and to make buildings energy-efficient. Public ownership of the big energy companies to break the power of the big oil CEOs and to redirect these resources toward green energy projects. A “just transition” with retraining program to ensure those who work in polluting industries are able to find jobs of similar quality in new green industries. For a new political party that represents the 99% – not big fossil fuel corporations – that fights for the needs of working people and the environment. Next articleNurses Fight for Ebola Preparedness – AND WIN!